One of the Japanese media's favorite topics is how China copies everything, whether that be giant Gundams or toys. But Japan is no stranger to ripping off the creative work of others. 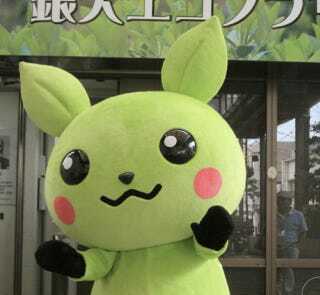 This is "Eco-chan", the mascot for an environmental community center in Japan's Yamaguchi Prefecture. Let's not screw around, Eco-chan sure as snot looks like Pikachu. Eco-chan is supposed to be some sort of woodland fairy, but it looks more like somebody in a green Pikachu costume. The character was first unveiled last fall (without mention of Nintendo or Game Freak), and cute characters like this are common for Japanese companies, public utilities, services—you name it. But Eco-chan? More like Copycat-chan.